Journalists on Facebook: Official Pages or Subscribe Button on Regular Profiles? I was talking with John Shehata from ABC News yesterday about Facebook, and he brought up an interesting question. What’s a better approach for journalists, creating official Facebook Pages or enabling the subscribe button on their regular profiles? So it seems they are still officially in favor of either approach. Since the subscribe button has only been around for a month or so there are still plenty of well-known journalists using official pages, for example Nicholas Kristof of The New York Times. Kristof’s page has 230K+ likes so it makes sense to keep that going. But in checking around more journalists do seem to be utilizing the subscribe button on their regular profiles. Shortly after launch Facebook put up a list of media professionals that had already enabled the button. And more journalists are doing so each week. Forbes recently posted a list all of its journalists that users can subscribe to, so they’ve opted to go that route. One advantage of using Facebook Pages is access to better analytics data via Facebook Insights. Another is they allow journalists to keep their personal profiles completely personal, which is attractive to those who like to maintain a firm boundary between their work and home lives. However the ability to control what is shared with subscribers from regular pages helps to offset this advantage. Pages also allow for more functionality like special widgets and custom tabs. But in most cases functionality like that is best suited to a news organization’s main page as opposed to individual journalists. In addition in Facebook official pages surface in Page search results, separate from People results, which is helpful if a journalist has a common name. However regular profiles with a lot of subscribers tend to surface high in people results, so that too is offset to some degree. With all this in mind I’d expect that using the subscribe button on regular profiles will continue to evolve towards being the default approach for journalists on Facebook. And since not every media professional is a “public figure” that necessarily warrants a Facebook Page, in practical terms this may prove to be the best fit for many news organizations. So my advice to news organizations is to experiment with using the subscribe button on regular profiles and see how that goes. You could consider mixing in few official pages for well known personalities, but you’d want to be careful about fostering a divide between “A-Listers” and the rest of the staff. 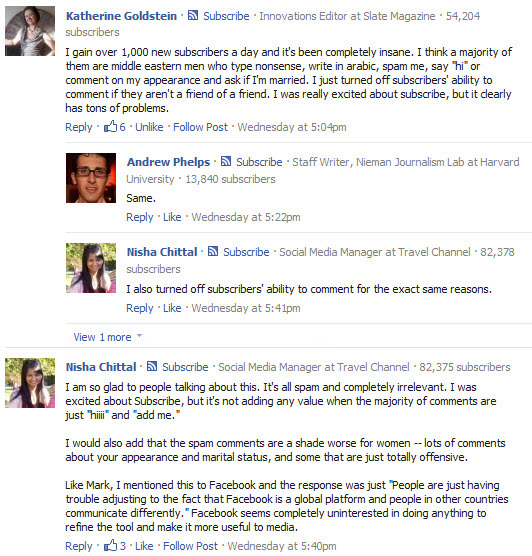 In January 2012 Facebook shared some new statistics on journalists using the subscribe button. According to Facebook thousands of journalists have enabled Subscribe and the average journalist has seen a 320% increase in subscribers since November 2011 (though that figure is based on a sampling of only 25 journalists). However in response to that announcement Jim Romenesko made the point that for many journalists the quality of the subscribers is poor and spam is frequent. However Craig Kanalley of NBC News didn’t agree with that sentiment and set out to prove it. Another advantage of this new system is that you can integrate your social media RSS feed into other systems like Drupal, WordPress, or other feed aggregation systems. That’s a good point Matthew, thanks.